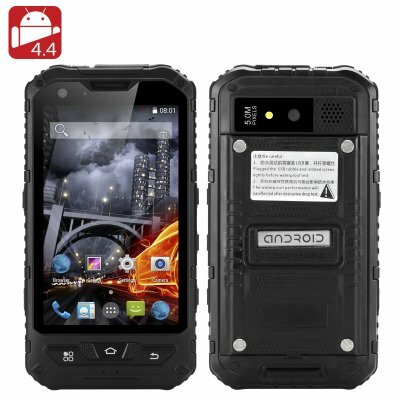 Successfully Added 4 Inch Rugged Smartphone Phone - Dual SIM, Android 4.4, Quad Core CPU, IP67, 1GB RAM + 8GB ROM, Two Cameras (Black) to your Shopping Cart. Enjoy a fun time outdoors without worrying about damaging your smartphone. This 4 inch rugged phone is well protected against the elements and comes with lots of great features. If you are looking for a secondary phone to bring on outdoor trips, then this 4 inch rugged smartphone would be a good option. It’s solidly built, compact and comes with a 4 inch display that is not as prone to damage as large phablets. Thanks to the IP67 waterproof rating, the phone can even be submerged in water for up to 1 meter and is totally dust tight. With a powerful 3000mAh battery, the phone offers up to 6 hours of continuous talk time and 120 hours on standby. With Android operating system, you will have a convenient interface to use, Play Store access + 8GB of internal memory and 32GB externally. You will furthermore have two cameras at your disposal to snap pictures in great quality of all your favorite memories. With a wide range of supported networks: 2G (GSM 850/900/1800/1900MHz) and 3G (WCDMA 850/900/2100MHz), you will be able to enjoy a stable connection and fast Internet speeds. You will also have a strong LED flashlight to guide you in the dark.